NOTE - This can only be applied after the caption encoding has already been ordered and processed. Click on a file in your 3Play Media account, and navigate to a processed caption encoding down at the lower right of the File show page. 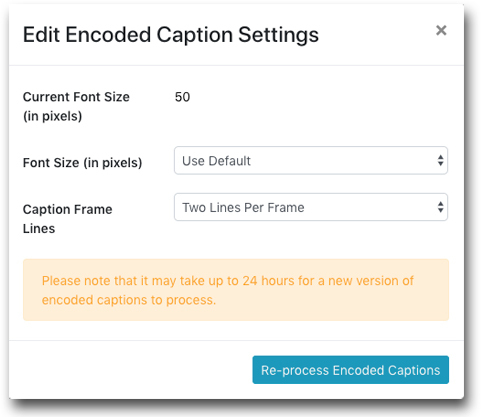 Click the Edit button to bring up the options for the Caption Encoding. This will bring up the options to change font size and switch between One Line or Two Lines of captions. Choose the options for desired Caption Encoding. 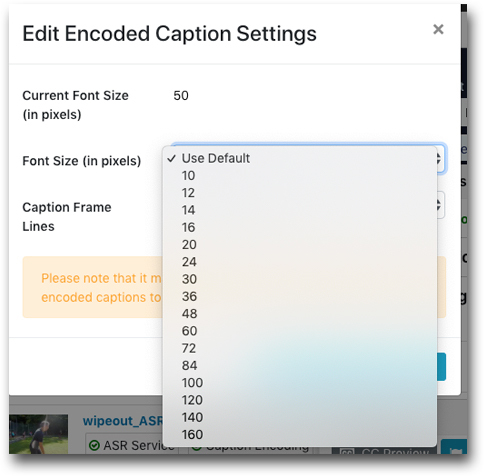 Note- The Default size of captions is 15% of the height in pixels, for two lines of captions and 10% of the height in pixels, for one line of captions. Choose a new font size. The font size value is in pixels, so check the pixel dimensions of the original Caption Encoding to determine what font size to choose. Choose between one line of captions or two. The encoding will then begin to reprocess with the new font size and/or lines of captions. 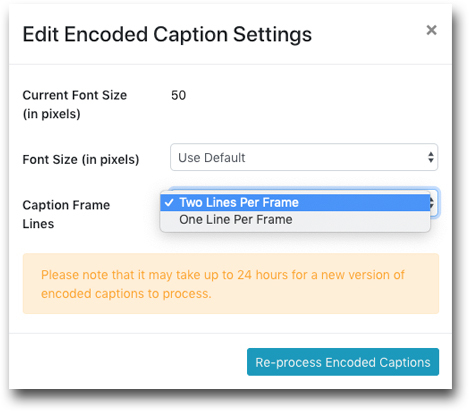 The newly ordered Caption Encoding can take up to 24 hours to process. Once the file is re-encoding and "in progress" you will not be able to submit again, until it is finished processing.